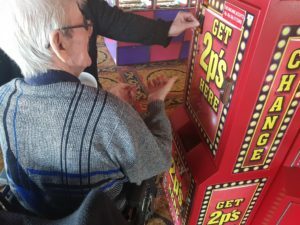 Residents of Byron Court have regular day trips out to venues or events of their choosing and the consensus for the most recent day was a trip to Southport Pier! 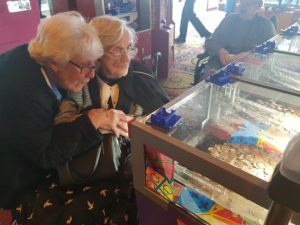 A number of Residents hopped on to the OOMPH minibus in May 2018 and set off on their way clutching their bags of 50, 20 and 2 pence coins ready to win big on the arcade machines. It was a lovely day to see the Residents enjoying the glorious sunshine at the pier, interacting with different people and having conversations about past times. As it was such a lovely day we were able to see the views of the neighboring town Blackpool! We had two Residents in particular that took a shine to the two pence machines, hoping they would win a pretty penny or two!